Blue and white festive Owl badge. 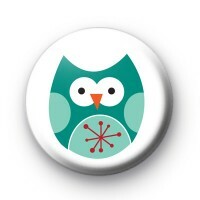 This winter-themed Christmas Owl makes the cutest button badge. It is a blue owl with a red snowflake. It is so adorable and a subtle nod to Christmas. So if you love Christmas but like to be a little more low key this could be the badge for you this festive season. Our Christmas owl badges are really popular and are a cute addition to any Christmas jumper or Christmas outfit. We have hundreds of both fun and traditional Xmas badges to choose from so be sure to take a look through our category. These badges are perfect to hand out at carol concerts or school nativity plays. Handmade gifts make the most thoughtful gifts.